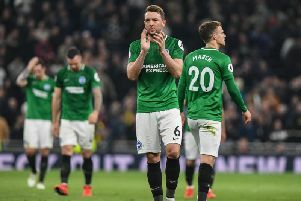 Brighton striker Glenn Murray and winger Jose Izquierdo are both doubts for Brighton's Premier League match away to Burnley on Saturday. Murray went off with a shoulder injury against Crystal Palace on Tuesday and Izquierdo limped off with a knee injury in the same match. On top-scorer Murray's chances of being fit, Albion boss Chris Hughton said: "We'll assess him in the morning. Probably this morning it wasn't as bad as what we thought it might be, so we'll assess him and give him every opportunity. On Izquierdo's chances of being fit to face the Clarets, Hughton said: "It's the same as Glenn. We expect both to train tomorrow and then we'll assess it from there. Alireza Jahanbakhsh is back in training but Saturday will come too soon for the winger. Dale Stephens is back available after suspension but Shane Duffy serves the first match of a three-game ban after his sending-off against Palace.